What is a Native file format? Native File simply refers to a file that has the same format at the program that created it. This means that Microsoft Words native file format is doc., also known as a word document. Although Microsoft can equally create PDF files, it’s native file, and the language that it speaks fluently is the Word document. I use the analogy of language to better explain the next point. Just like a word document file can be opened by any Microsoft word program, this is because they are all speaking the same language fluently, and so the file is just part of their conversation. Using that same analogy, Microsoft Word and Abobe Illustrator do not speak the same language, and so opening a native file from one of these two in the other program will simply not work; the two programs are not speaking the same language. This is why PDFs are so prized, and you can learn more about that in the paragraph to the right. The Native Files that are saved by InDesign, Illustrator, Word and Photoshop can theoretically be opened by the same version of the same program on another computer. That means we might be able to open a file that you’ve saved as an Illustrator file (.ILL), because both programs should speak the same language. Unfortunately, this all makes the assumption that both computers have the same font banks and extensions (add ons), and if they don’t, then the two programs still won’t get along, because although they might be speaking the same language, one just happens to know more than the other. This is why PDFs are so critical. Hmmm. You might notice in the below the continual use of the letting “PDF”. In I.T, graphic design and book printing, the letters PDF stand for Portable Document Format, and they are so common because it is an industry standard format for sending lightweight files whilst maintaining all the documents integrity. 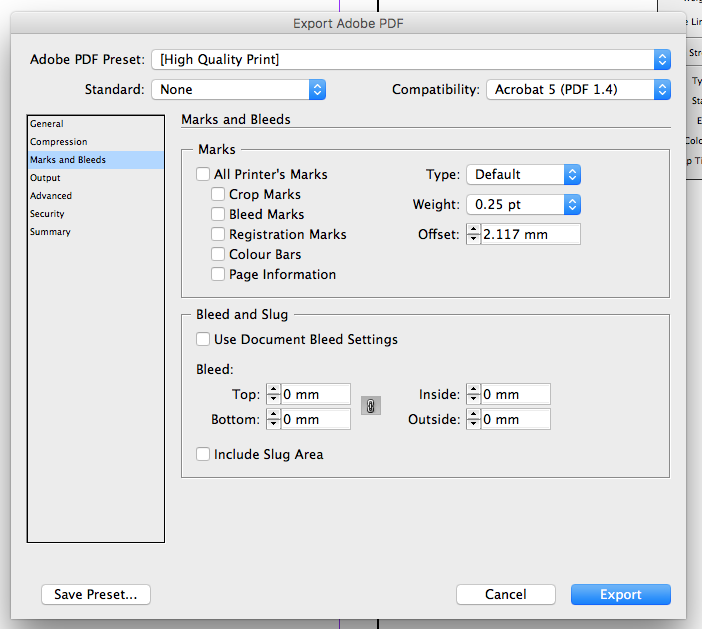 As you can imagine then, most work programs can output/export their content to a PDF file. This means that if a person does not have the program that the document was created in, it doesn’t matter, because the portable document format brings with it all its critical information to be viewed as it’s creator intended. The PDF file format is by far the easiest and fastest way to send us your print file. Not only are PDF files complete (with no missing fonts or links) but they hold true colour management, trapping and open pre-press information. Most PDF files are small enough in size that they can be sent via email or via our FTP. So what are crop marks and bleed? All printed elements that are not intended to bleed off should be a minimum of 5mm within the edge of the page. This will ensure trim tolerances are maintained. Allow at least 5mm bleed for print components that do run off the edge of the page. Crop marks can be set in Illustrator or InDesign when exporting to a PDF and should be 2.3mm offset, and allow for 3mm bleed. 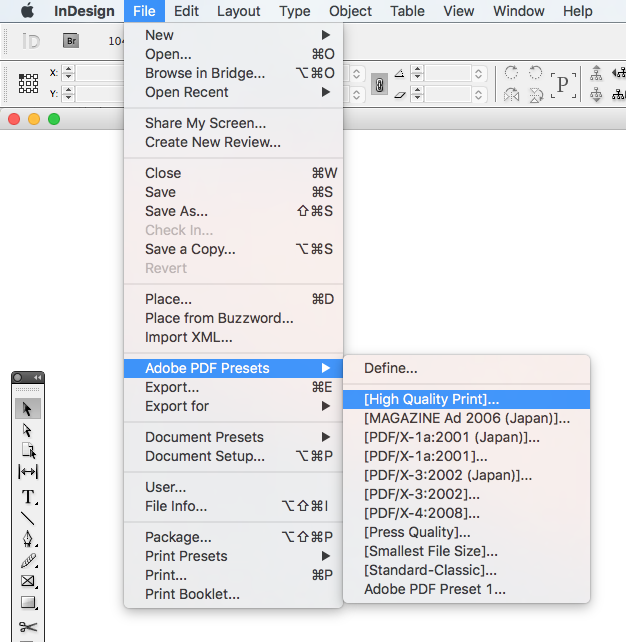 To save your file as press-ready as a PDF through InDesign, simply go to file, Adobe PDF Presets, Select High Print Quality, Select a file name and a file location (desktop), and then on the left-hand side of the new box you should see Marks and Bleed. Once you select on Marks and Bleed you’ll be given the opportunity to select the tick box Crop Marks and Bleed Marks, and then at the bottom in the bleed section, enter 3mm into the top, bottom, inside and outside, and then select Export. Your file will then be exported to your Desktop under the file name you chose. If you’ve been using Adobe Illustrator, all you need to do is proceed to File, Save As, and then in the new box, create a file name, select a saving location (which is most likely your desktop) and then using the drop-down format field, change it to Adobe PDF (PDF). If you would like to provide your own word document PDF file, please remember that we’re not going to touch it for you, and it’ll print exactly as it is saved as a PDF. If you would like us to quote your type-setting, and unless you are a designer then we do recommend it, then please provide your text as a word document, formatted the way you would like it. We’ll use our wonder-lust skills to mimic your style, but with all the flair of professionalism. Individual photoshop files are the least desirable file choice to use when creating a complete book file. Compared to Illustrator and InDesign, which are vector based, and so very light, photoshop crates pixelated files and so is very heavy. This means 1. you’ll get a poorer result, 2. the files will be a lot larger and 3. Barossa Book Printing will still need to take each of your page files and create a book off of them in InDesign. If you are considering using Photoshop to create each individual page, please contact us in advance. Not that it happens often, by people have provided files saved that are several GB, and they can be troublesome to work with. We've included a few other book printing/print preparation details in the below for good measure. Solid black areas should be made up of 60% Cyan, 50% Magenta, 50% Yellow, 100% Black to give a strong rich colour. However, this break-up only applies to CMYK jobs. Print jobs that are black and PMS should have the black set up as 100k only. Set fine text in 100% k to prevent registration allowance. Make sure all colours are nominated correctly as PMS or CMYK. PMS stands for Pantone Matching System and CMYK is the abbreviation for Cyan, Magenta, Yellow and Black. The four standard colours, CMYK are used to mix and make any standard colour in the printing process. All images must be saved as CYMK and 300dpi. RGB images will not be printed. If your file is only a one-off print than please convert your text to paths/outlines. If you would like us to be able to use the font in the file for a web-to-print business card than please export and pack the Indesign file and send it to us whole. Do not outline the text. To prevent paper cracking on the fold we recommend that you include the scoring option on your quote request. If you get into a position and need us to lend a hand, please just give us a call. if the situation requires it, we can remotely log into your workstation so that we can export your print file for you.